Mustang enthusiasts will appreciate this commemorative 40th Anniversary metal sign of the quintessential American pony car. A great-looking sign to decorate any Mustang lover's wall, at home, the garage or office. Or a fantastic gift for anyone who loves American cars. This is a metal sign, made in the U.S.A. Measures 11.75 inches round. UPC: 6-05279-11206-7 | Part No. 1206. 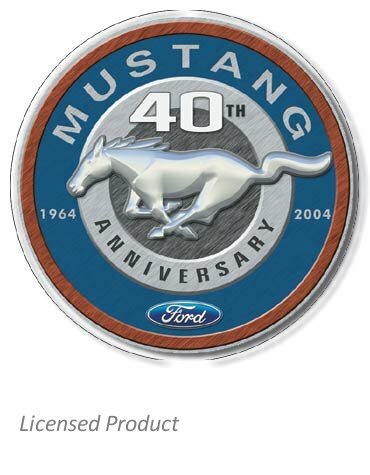 Ask a question about "Mustang 40th Anniversary 1964-2004" Tin Sign.